It’s spring, and gorgeous produce is beginning to appear in the markets — as well as my neighbor’s expansive backyard garden! I’ve been admiring his handsome rhubarb patch from afar and trying to muster up the courage to ask for some. We’re new to the neighborhood, you see. Inspired by Tsh’s Q & A ‘Do you know the people in your neighborhood?‘ and the fascinating discussion about community that followed, I decided it was time to put my shyness aside and I knocked on his door. He generously offered me ‘carte blanche‘ on his patch–for the whole season. I was thrilled! Rhubarb is my favorite early summer fruit; I just love it. As a child I dipped the pale pink stalks in sugar and munched them raw. As a teen I paired rhubarb with strawberries, baked the fruit into pies and sold them at my local farmers market. (for $5 dollars!!). Now, the options are endless and I usually run out of rhubarb long before I finish experimenting with new recipes. I should mention, before we get any further, that rhubarb is actually a vegetable. Did you know? It can be used in both sweet and savory dishes, but my guess is that the majority of it ends up in a pie or a terrific crumble. If you haven’t yet, pick up some rhubarb and discover what all the fuss is all about. I’ll let you in on a little secret: I never buy my rhubarb. It seems there is always someone willing to have me come take it off their hands and every spring I have been blessed with offers from friends, family –and now neighbors. So before you buy rhubarb, ask around. Post a friendly request in your facebook status or post a note on your community church bulletin and you may be pleasantly surprised by what turns up on your doorstep. Your second best option for sourcing rhubarb would be a farmers market, where it is guaranteed to be fresh and affordable. Local growers seem to know nearly everyone has a rhubarb plant or two in the backyard, and keep the prices reasonable. Lastly, you can find rhubarb in some grocery stores, although how they manage to get away with charging $4-5 for a couple of stalks is beyond me. Finally, fresh produce that doesn’t spoil within a few days of purchasing! I keep mine in the crisper drawer of my refrigerator for several weeks; it goes a little soft, but the flavor is still there. Since rhubarb is almost never eaten raw, it doesn’t matter if it ‘wilts’ — it’s going to be stewed into something lovely eventually. Rhubarb freezes beautifully. Wash stalks, chop into 1/2 – 1 inch pieces and pack into freezer bags to be enjoyed year round. You’d be hard pressed to find another fruit or vegatable as user friendly as rhubarb. It has no seeds to deal with, lovely skin that brings vibrant color to dishes, and it is easy to chop. 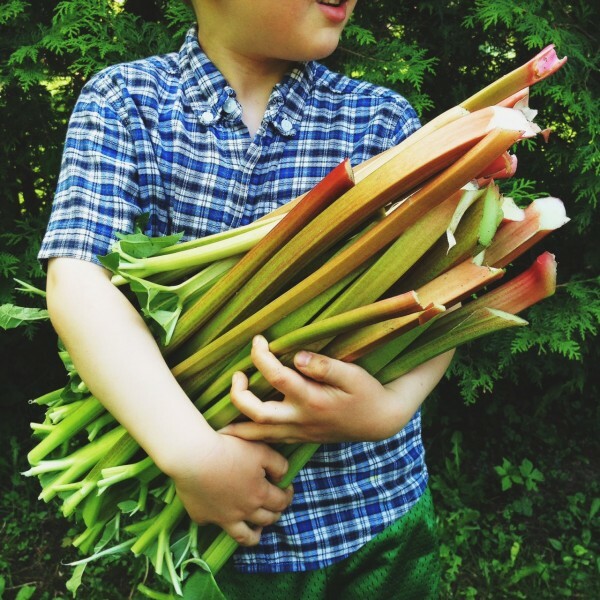 I let my four-year-old son chop alongside me as the rhubarb lends itself well to knife skills for beginners. Cleaning is a cinch. Remove the leaves, if still attached, and safely discard them as they are poisonous. (They are fine to compost.) Trim ends; wash and dry. That’s it! Your rhubarb is now ready to be used. It makes up for the pesky dirt, laden leek, doesn’t it? From juicy pies and tender cakes, to brilliantly colored sorbets and delicate mousses, rhubarb has been making a comeback, even in gourmet kitchens. I stew mine gently with honey into a simple compote, then spoon the sauce over pancakes, yogourt or custard. Other favorite uses are in jelly, party punch and muffins. Here’s my current favourite rhubarb dessert. It’s not much too look at, but between the cake’s tender crumb and the tangy compote-like topping, it’s a winner. Serve with a dollop of whipped cream or vanilla ice cream for a seasonal treat like no other. Be sure to read through the recipe and have all the ingredients assembled before you start. Preheat oven to 350°F. Line a round 9-inch round cake pan with parchment paper and butter pan thoroughly. Mix together the rhubarb, cane sugar, 1/4 cup of fllour and the orange rind. Pour into the prepared pan. Dot with butter and place in a preheated oven. Cook only as long as it takes you to put the cake batter below together. For the Cake: In the bowl of a mixer combine all together the remaining cup of flour, baking powder, salt, sugar, butter, milk and vanilla. With the paddle attachment, beat ingredients for two minutes, scraping down sides as necessary. Then add the egg. Beat for another minute. Pour batter over rhubarb and return the pan to the oven. Bake 35-40 minutes or until a toothpick inserted into the cake comes out clean. Remove from oven and allow to cool for at least 15 minutes. Run a sharp knife around the edge of the pan. Place a plate or cake platter on top of the pan and re-invert cake onto the platter. Remove tin and peel off parchment. Serve warm. Strawberry-Rhubarb Shortcake :: Pete Bakes! Our Facebook fans were divided in their love for rhubarb. What about you? Do you have a favorite rhubarb recipe? Please share! Love rhubarb!! We had a few huge plants when I was growing up. I actually just finished off a homemade rhubarb strawberry crumble after breakfast this morning! Yum! Your pictures look fantastic and are making my mouth water for more. I just ordered more from my farm delivery co. here in the UK to freeze. I do want to mention, that although rhubarb can last for 2-4 weeks in the fridge and old wilted rhubarb still tastes fine it has lost a good deal of its vitamin C by then. I would opt to cut it and freeze it until needed. It will retain more nutrients that way. Great post. Can’t wait to try your recipes! .-= Pure Mothers’s last blog: Earth Day Exploration =-. Fruit crumble for breakfast? You folks in the UK really know how to live! Good tip about the vitamin C. Thanks you. Freezer it is! 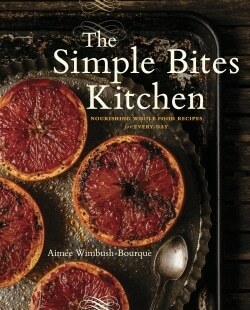 .-= Aimee’s last blog: Spotlight Ingredient: Rhubarb (Recipe: Rhubarb Upside-Down Cake) =-. When I was a kid, we ate rhubarb fresh out of the garden with a stalk in one hand and a bowl of sugar for dipping in the other. I still love the stuff. I made a great individual upsidedown cakes with it that has some candied ginger in the topping. I probably used a little more sugar too, since mine caramelized. Now I have to go raid my mom’s rhubarb stock! Thanks for the link, Carrie! Love, love the individual portions. Not only is it easy to cook with but when combined with the strawberries it makes a delicious sauce. Thanks for sharing your sauce, Vicki; what a pretty color it is! My all-time favourite rhubarb method is to stew it with some sugar and eat it with toast for breakfast the tangyness wakes up my tastebuds ! .-= habanerogal’s last blog: A Quickie Quitting Update =-. Cary, I let him use a small paring knife. I keep it very sharp, which may scare some people, but it makes the cutting easier for him. Sometimes with a dull knife, kids will just apply more pressure, which can result in a slip of the hand. I love rhubarb and was fortunate enough to marry a rhubarb lover. We now also have a three year old rhubarb loving girl. This week has already included my mom’s recipe for rhubarb pudding cake (similar to your upside down cake) and a rhubarb crisp. Yum. Tonight, we are trying a recipe for pork chops with a rhubarb cherry sauce. I try to explain the seasonality of food to my daughter as we cook and how special it is to have certain foods when they arrive in the spring. Mmm, it all sounds so very good, Gabrielle. I’d be curious to know how you enjoyed your pork chop. Really? How bizzare. Well it goes to show you, you can’t believe everything you read! I adore rhubarb! In fact, I just posted a recipe for rhubarb-lemon chicken. Some of my other favorite rhubarb recipes include red raspberry-rhubarb pie, rhubarb cake, rhubarb tart, rhubarb tea, and rhubarb roasted in white wine and served with cornbread and vanilla ice cream. Long live rhubarb! 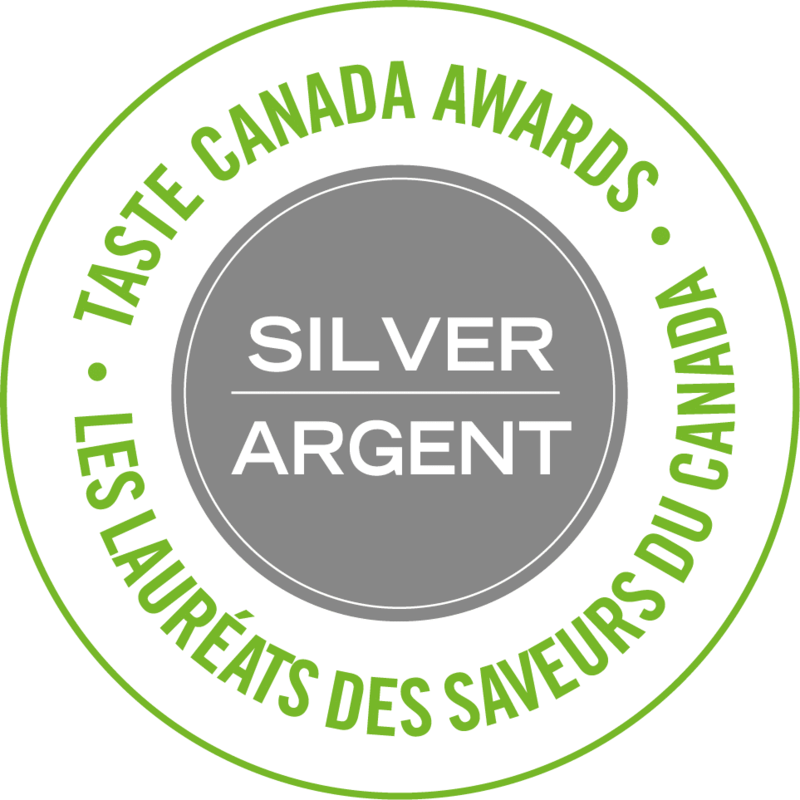 .-= Jennifer Jo’s last blog: Savory rhubarb, a sprightly affair =-. I’ve actually never been a huge fan of rhubarb, but it was growing in the garden at the house we’re renting so we gave it to the neighbor to use. She ended up making a rhubarb and cherry jam that was the most delicous thing I have ever eaten. I don’t have a recipe for it, but it was a great pairing!! Wow, I can imagine it WAS! 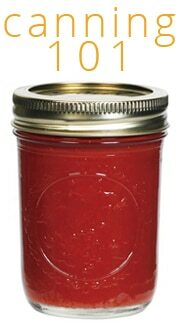 A friend gave me several jars of her pineapple-rhubarb jam last summer. It was incredible. Now all I need is the recipe! 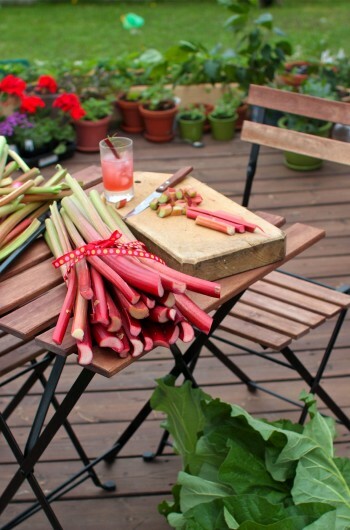 I LOVE Rhubarb and have posted 3 recipes about it on my blog. Yummy! Great 101 on it, it is so underappreciated! Thanks Kelsey! How nice of you to stop by. 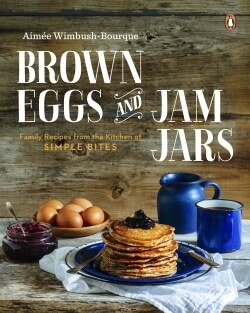 I’ll be stalking tNC for those recipes! Just made me a rhubarb apple pie this evening. Thanks for the education. I really know very little about it. My husband used to eat it dipped in sugar too. Good eatin’! oh. and the photos are really beautiful! 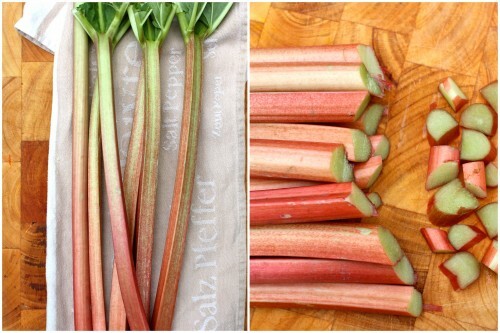 Thanks for this crash course on rhubarb. I never knew how rhubarb should taste like or to cook it. Your cake looks amazing, I will surely try yours as a first experience. Great job! 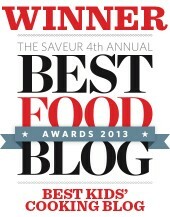 .-= Victor @ Random Cuisine’s last blog: Honey Joys =-. That rhubarb upside down cake looks so good! .-= Kevin (Closet Cooking)’s last blog: Spinach Pesto (aka Spanakopita Pesto) Pasta with Paprika Grilled Chicken =-. Mmm, rhubarb. I was eyeing my neighbours plant last night. They are back soon so I hope to “liberate” some from them very soon. 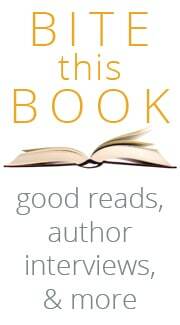 .-= Cheryl Arkison’s last blog: Best intentions =-. 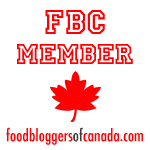 This is a great post about rhubarb, an ingredient which I think is still pretty intimidating for a lot of people. 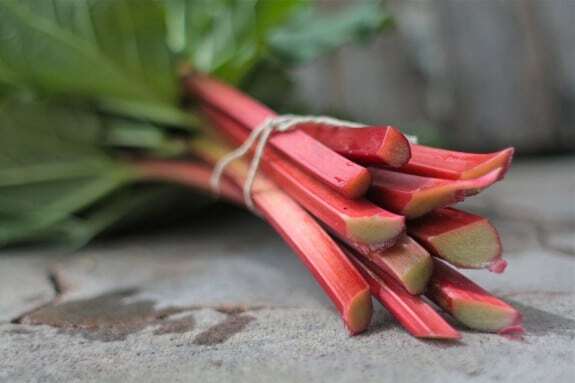 I hope it’s ok that I just linked to your post on my blog because we’ve got a little recipe carnival coming up and rhubarb is this week’s local ingredient:) I thought it would be helpful to share more info about the plant and how to use it. And very lovely photos of it too, by the way! 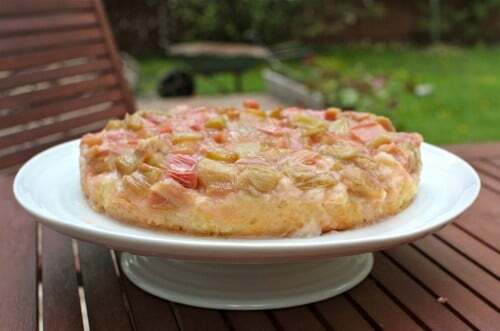 I love rhubarb and thought your cake looked delicious so I tried to make it. Tried being the operative word. It has been in the oven for 50 minutes now and the middle is still not set. I followed your recipe and instructions exactly. where did I go wrong. is it my oven? I have a convection oven, does that make a difference? .-= kate’s last blog: In search of the elusive shut-eye =-. OK, just keep cooking it. I can’t imagine what went wrong, but perhaps there was more water in the rhubarb than usual….? If the top browns too much, jut cover it with foil. Oddly enough I tried an apple cake last night with similar results. It was a new recipe, and just wouldn’t –and never did– set. ok, after 50 minutes, it FINALLY set, and just at that. But what a delicious moist cake with a great tangy rhubarb topping. This recipe is going into my recipe scrapbook for sure! Aimee, there is a gold mine of rhubarb inspiration at food52.com. Thanks for your wonderful posts. I’ve been a subscriber to Under the High Chair for over a year, and really appreciate your point of view. Cheers. Rhubarb is one of my favourite thigns and for some reason i always forget to make anything using it. I have some rhubarb and this looks like the recipe for me. Thanks. Looks beautiful! Made this today – beautiful! can I continue to use my rhubarb after it goes to seed? I love rhubarb!!! The best is it freezes well and in the middle of winter when your thinking the cold and snow will never end you can make something yummy with it!!!! Rhubarb slush is extra yummy when it is hot out!! Love rhubarb custard in spring.